MissieBunnie's Private Space: uncertain thursday! there are so many things coming up lately.. happy, unhappy, apa pun ada! 1) on monday, my beloved went to the HRM class with me.. he was really sweet i know! but he was very honest too... cos he was halau-ed by the lecturer due to his honesty! LOL! so summary for my tuesday..
my night was bad because there was this particular someone ruined my night. but refering to the someone, if he is reading my blog, im sure he knows that i'm talking about him! so here you go MR! 3) on wednesday, moral class was OK & i cant believe i had a fight with him! finally the volcano exploded. everyone was shocked when they saw the both of us arguing. at the end, justice wins! cos everyone realised tat.. he was the one tat is being ridiculous to us. i argued with him not just because i beh tahan him d but also i'm speaking for everyone's behalf. kaw has been ranting abt how bossy was him to pH and me. i've been ranting how upset & pissed off with his action to pH and kaw. pH has been ranting abt how ridiculous was him to me and kaw. if i were the only one having problem with him, perhaps.. maybe is my fault la. but now, everyone also got! obviously it could be our fault but someone else's. when i pour everything out, i wish tat he could at least listen 1 or 2. anyway, everyone there to witness the whole incident knows tat.. he didnt want admit that he is wrong. hopeless case! right after the class, i joined pH, kaw and fiona for lunch. it was awesome! after lunch, baby lee & I went to KLCC to settle some work issues as well as hand up SL's report. when we settled everything in KLCC.. we walked all the way from KLCC to Pavilion. My all time shopping paradise. 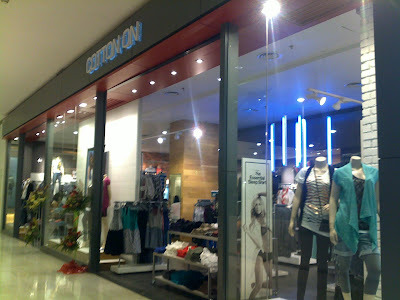 Now, i love it even more because Cotton On is there! weeeee*.. i have to hunt for white collar shirt for the photo session on this coming Monday! shopping time is always the best time! now i'm done with my suit for the photo session & viva! YIIPPPEEEEEE! 2 comments on "uncertain thursday!" LOL! nice rite! LOL!.. i like them so much too especially the monkey with the Golden Middle Finger.. hahaha..
change? HOPEFULLY! cos i dun wanna c more ppl get pissed off by him! LOL!